The bear without a brain was actually quite profound.He tells adult readers to stop, look, listen, and learn from nature, animals and little children. Intellect isn’t as important as heart and intuition. Next: Next post: Switcheroo: You Want Me to Pretend? 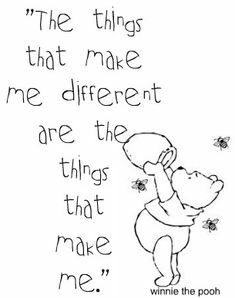 I love…… THE things that make me different are the things that make me! So way ahead of his time. Thanks for sharing Melanie. I love every one of these, Melanie. I see now there was no reason for me ever to write. Pooh and Lao-Tzu said it all before me. oh no – adult minds need your kind of aphorisim but I did think of you for quite a few of these quotes! Wonderful! 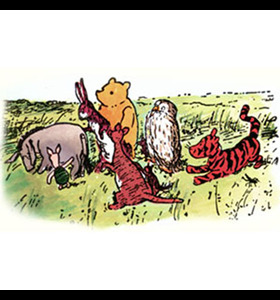 I have long looked to Winnie-the-Pooh as a source of wisdom and inspiration. It was fun to read through all these little tidbits you gathered here! My little six-year old is quite a Philosopher. 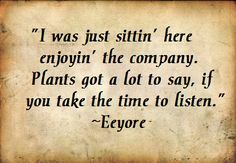 He reminds me of Pooh with the things he says! Thank you. This was a treat. We have a friend of the family who caught his roommate at University slipping a Winnie the Pooh book into his bookshelf, just as he was sneaking one into his own. They started a “Coddleston Pie” group and would advertise meetings, where the young and young at heart would ponder things together. If someone called asking what Coddleston Pie was, they would say they had a wrong number. Only true Pooh lovers would know.